Raised in an art emphasized home, somewhere there is an artist buried deep inside me. Weekends were spent going to flower shows, participating in flower arrangements or helping my mother with her bonsai. I now look back and wonder, how my mother had so much time to accomplish so much in a day. She did not have online distractions. There was so much freedom that we enjoyed, freedom of expression, freedom to question, freedom of choice. I almost took it all for granted and assumed that was the norm. Dad would always tell us, ”It is the mark of an educated mind to be able to entertain a thought without accepting it” - Aristotle. He would welcome difference of opinion, never disrespect. My freedom of expression, really stems from my childhood and I can see it blossom in my adulthood. So much like my dad, I will do what I feel is right and righteous not because it is a mere dictate from others. And I see this in my photography too, bold dark strokes of light and colors, never irresolute always very strongly stated. It also stems from my penchant for painting and influence from Chiaroscuro. The light and shades almost replicate life. In recent times, I have seen myself fall in love with airy water colors, carefree and effortless, so unlike the chiaroscuro style. Colors bleeding into each other, yet having a form and definition. Neither style is easy but represents art in such a different way. My morning glory (first image) is one of my first trials that represents my love for water color. 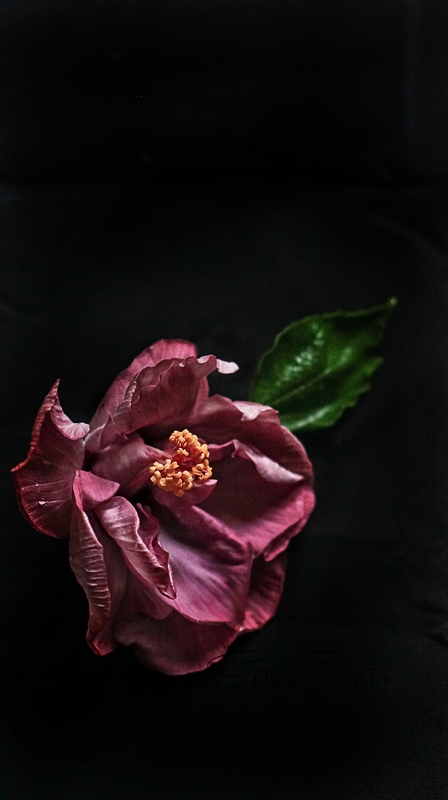 And the second one is a hibiscus from my mother’s garden a more bold look - maybe like an oil-painting. I am not sure if I have been successful at it….I absolutely enjoyed creating both and almost lost myself in them. Simply awesome! Would really appreciate if you give a few tips on how you've taken these shots! I am experimenting too and would love to be able to try something like this. Many thanks! For the first image I used a 100mm lens that gave me a beautiful bokeh and a watercolor look on the background with the lens wide open. There was a lot of light and the sun was shining on the flower, covered part of the sun by standing between the sun and flower with camera. For the second image I used a 16-50mm lens - indoor shot, blocked light and placed flower on a dark surface. Wanted a moody look. Let me know if you have any further questions - just email me at turmeric53@gmail.com. Thank you, simi. Very few people who so willing share what they do! Truly appreciate it! Thanks again. Incredible and awesome pictures ! Lovely water color and oil paint effects captured by your lens!